The Min Pin (as it is affectionately called) originated in Germany and has been documented since the early 1800s, more formally so since 1895 with the formation of the German Pinscher Club. Evidence of the breed dates to the 15th Century and it was formerly known as the Red Pinscher that refers to the ‘small red deer’, found in the German forest. They were originally bred as stable dogs to eradicate rats and mice. The Miniature Pinscher can live up to 16 years of age. This is a proud and spirited little dog - all terrier and certainly no ‘toy’ - they are a loyal and intelligent companion. They are fearless, alert and make an excellent watchdog. If brought up from a young age with other animals, Miniature Pinschers will accept just about anything including birds and cats, while chasing away similar interlopers. Min Pins like to dominate so care should be taken regarding personalities and supervised introduction. The short, hard coat requires little care. In spring and autumn firm stroking by hand or a small brush will remove excess hair. Bathing is not often required as too much removes essential oils that protect the coat. A quick wipe with a warm face-washer containing a few drops of eucalyptus oil will both freshen and keep fleas at bay. Nails must be kept short - trim a little each week as this maintains compact healthy feet. 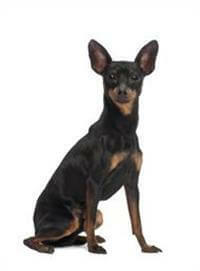 A Min Pin will be a very active, alert and an interactive member of your household, often behaving like an unruly child. While they always amuse and entertain they need a consistent set of house rules from the start. Be firm in your resolve or they will beguile you. Never walk a Min Pin off the lead, as they can be selectively deaf. All except the very young and the very elderly (too active). They tend to be devoted to the family as a whole, but may choose a particular member as their soul mate while still revelling in the company of all.